Taking the family skiing in the Alps requires planning, and picking the right ski resort in Switzerland, Italy, France, or Austria… you want convenient quality lodging, plenty of ski trails for everyone in your family, modern lifts, scenery, ski school, and things to do après ski. Here are a few of our favorite European ski resorts for family skiing in the French, Swiss Alps and Austria. We’ll keep skiing and exploring to provide more. 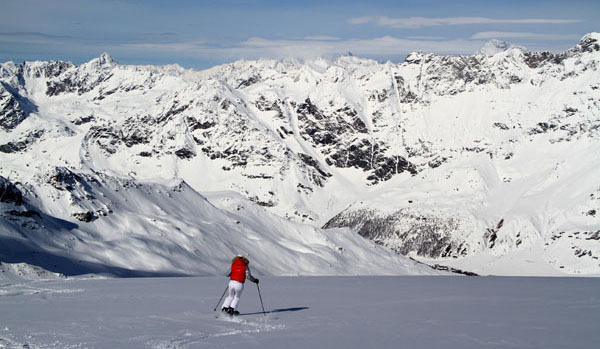 St. Anton Austria is located in the beautiful Arlberg region. An authentic alpine ski village sits at the base of this vast ski resort, you can ski on multiple peaks, village to village – Stuben to St Christoph, and off the 9,222′ Valluga summit. St Anton skiing has a big 4,944′ vertical, 41 modern lifts, and excellent ski school for kids, plus great on mountain chalets and après ski for parents, and 4star family-friendly hotels like Hotel Bergschlossl. Lech Zurs, near St Anton, is another huge Austrian ski resort with loads of family-friendly terrain on both sides of the beautiful valley, part of the Ski Arlberg pass – 94 lifts and 340 kilometers of ski terrain. 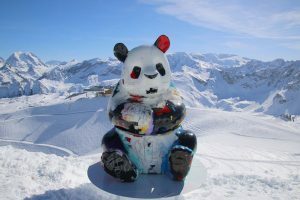 Courchevel France – part of Les Trois Vallées, is a beautiful family ski resort with perfectly groomed slopes, chalets at every turn, kids fun zones and Panda Bear on the ski slopes. You can ski from Courchevel to Val Thorens and Méribel all on one 3 Vallées ticket, so you have 600 kilometers of skiing in 8 ski areas. Zermatt is is best known for The Matterhorn, the most photographed mountain in the world at 14,693-feet, but Zermatt is also an immense ski region for families – once everyone is skiing well. Zermatt offers the highest skiing in the Alps at 12,791-feet, with 54 ski lifts accessing 350 kilometers of prepared slopes. Trains, trams and gondolas bring you to beautiful scenery, great snow, charming chalets, you can even ski to Italy for lunch. Zermatt village is car-free but bustling with ski hotels, shops and Swiss restaurants. Val Gardena in the Dolomites is historic, highly scenic, and heaven for skiers. The Italian Dolomites are vast, with 1,200 kilometers of skiing in 12 regions – much of which can be reached from Val Gardena’s famous ski slopes. Staying in the charming village of Ortisei in Val Gardena is perfect for an Italian family ski holiday. Cortina D’Ampezzo is in the stunning Dolomites, offering three unique ski areas, Faloria, Tofane and Cinque Torri – and its part of the Dolomiti Superski Region not far away. The ski slopes are wonderful, so is the Olympic ski village of 1956. A Cortina ski trip is stylish, relaxing and beautiful. 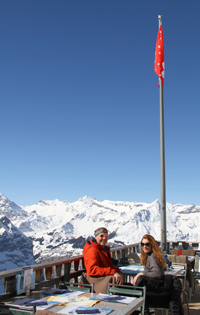 Engelberg Switzerland is heavenly, Angel Mountain, for skiing families. Just over an hour from Zurich, Engelberg is a lesser known but beautiful ski valley of two mountains – the sunny family friendly ski slopes at Brunni and the high elevation Titlis Glacier, with stunning scenery, a long ski season and legendary Big 5 off-piste ski runs for experts with a guide. Engelberg village is classic Swiss with full service hotels, an 1120 Monastery, Church and cheese making store.